In the midst of summer heat, time seems to become lazy – it stretches and yawns, while the white sun works after-hours and hangs high on the horizon until late in the evening. All of a sudden, we grow a need for afternoon naps, bottles of sunscreen, and glasses upon glasses of chilled rooibos. Summer appetites also differ from colder weather cravings – we want less comfort food, and more fresh, adventurous flavours. 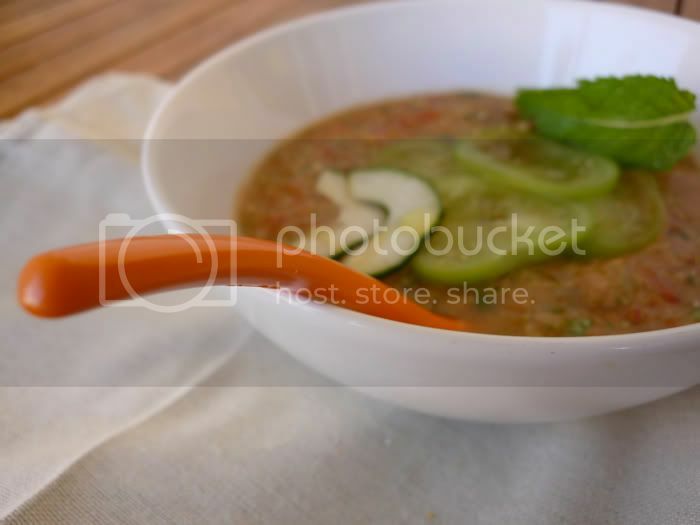 This soup is undoubtedly the dish for such heat. It’s incredibly refreshing and full of taste. 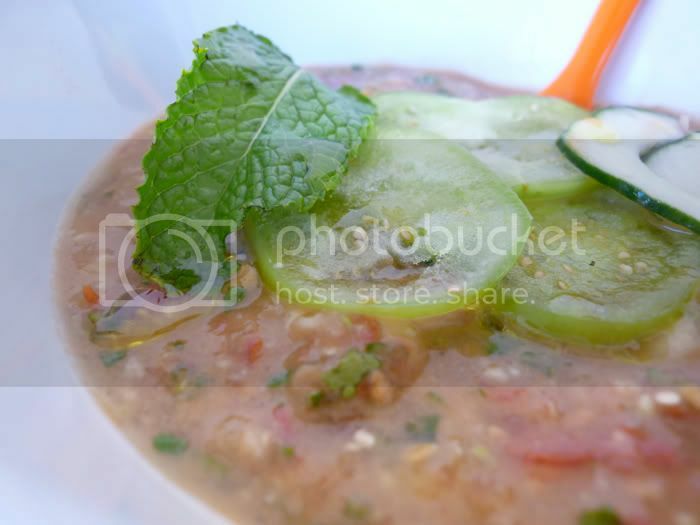 I’m always on the lookout for different ideas for gazpacho, and mint is what makes the flavours in this one especially interesting and layered. 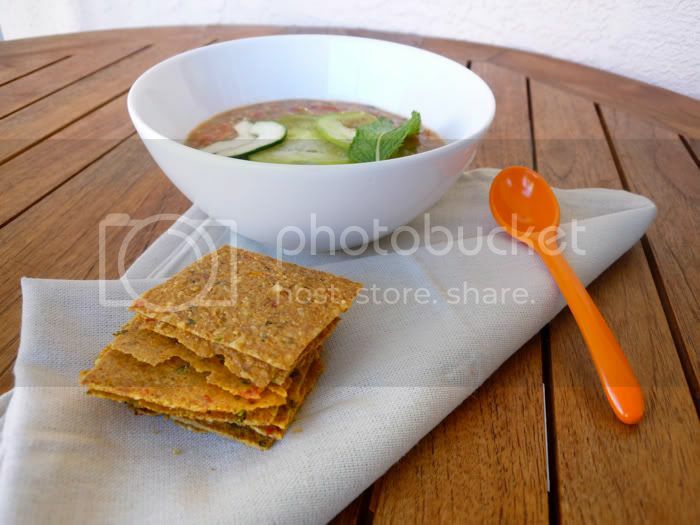 I also like to make raw Spicy Herb Crackers to accompany the soup. This recipe (from an old issue of Food&Wine) calls for green zebra tomatoes – a beautiful variety of heirloom tomatoes. Unfortunately I’ve never encountered them here in Florida. 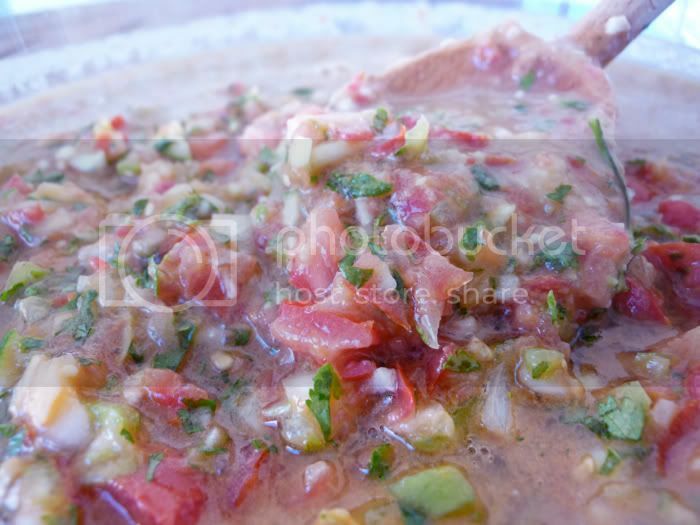 Instead, I chose to use organic plum tomatoes and tomatillos, which make a great pair. 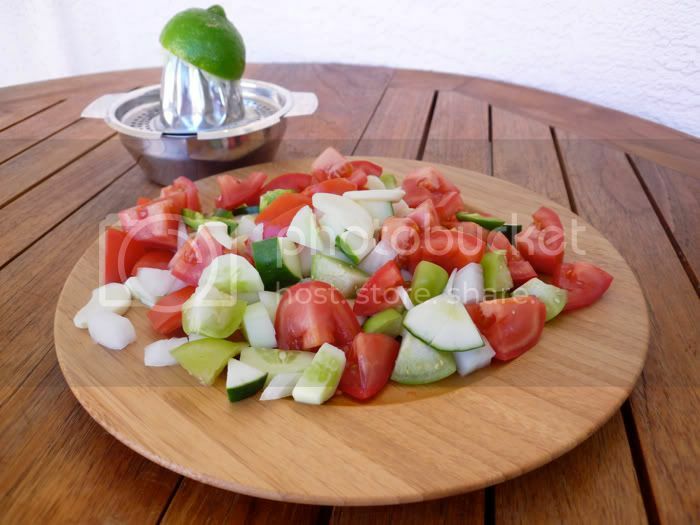 Using a food processor, combine half each of the tomatoes-tomatillos, cucumber, and onion with the avocado, jalapeno, garlic, lime juice, and 1 cup purified water. Blend until smooth and transfer to a bowl. 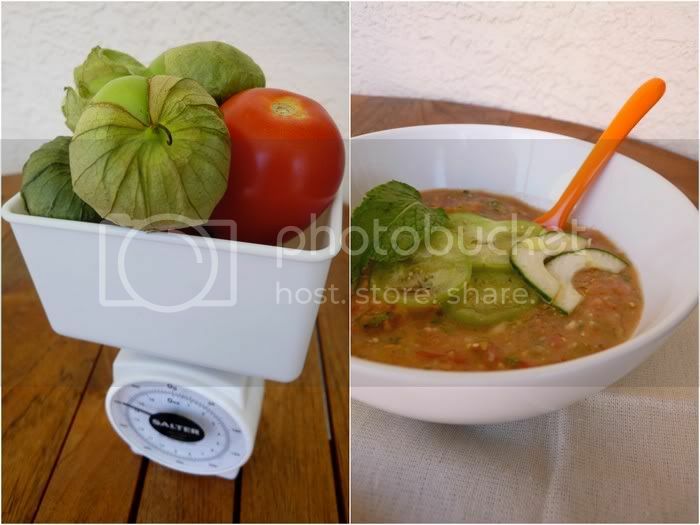 Put the remaining tomatoes-tomatillos, cucumber, and onion into a food processor, along with the mint, cilantro, and olive oil and pulse to make a chunky puree. Add the puree to the blended mass, salt and pepper to taste, and stir. Refrigerate until chilled. 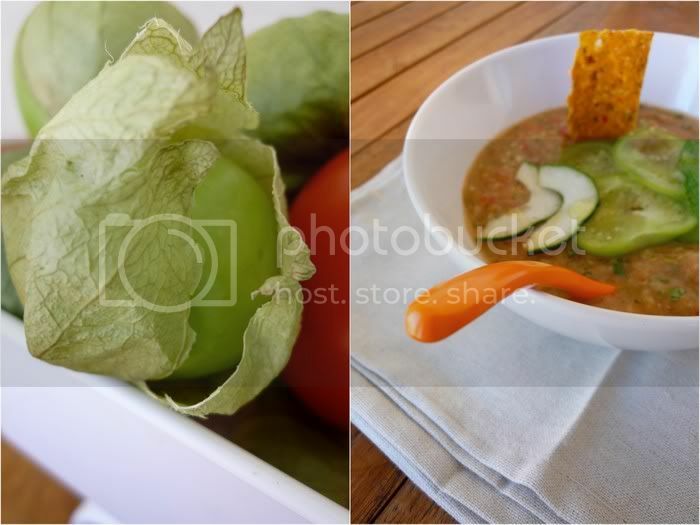 Garnish the gazpacho with mint leaves, a drizzle of olive oil, and any other ingredients you put away for dollup. Spicy herb cracker recipe here. 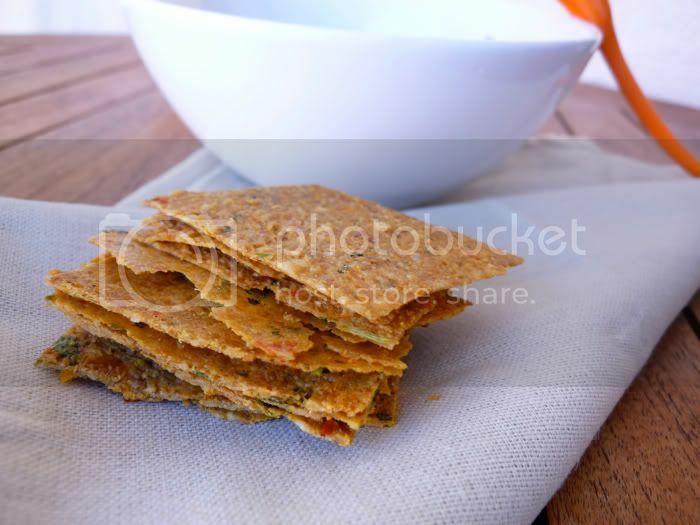 how do you make the spicy herb crackers? Anonymous, we can’t post it due to copyright issues. If you give me your email, I’ll be glad to send it to you. hello, i’d love to get the spicy herb cracker recipe as well! love your site! continue posting…SO inspiring :) thank you! can’t you publish it and write the source where you took it from? It looks absolutely delicious, and the photos are fantastic! Kiki: Unfortunately not. Emailed you. I’m ever amazed at your recipe selection and presentation, they’re always so fresh and interesting. Keep it up! Another Masterpiece! Thank you Anya and Masha for your sharing your beautiful food with us. Your photos sing with passion. What an amazing take on an old standard. You’re knife skills seemed to be extremely honed! Great pix. I am sooo making this! I have all of the ingredients already…woo hoo! Coco, I hope you like it :) Just made some again the other day too. 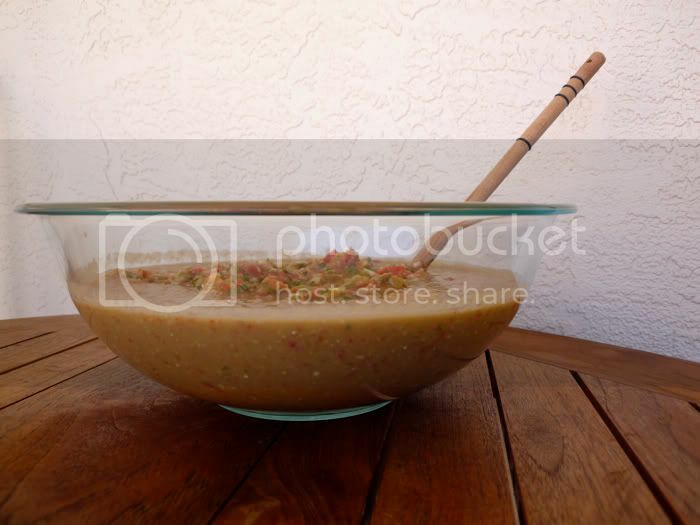 Excellent raw soup! And very easy to make! Thank you for another great recipe! P.S. Could I also get the cracker recipe, please. Thank you and all the best! Sorry for taking so long to respond. 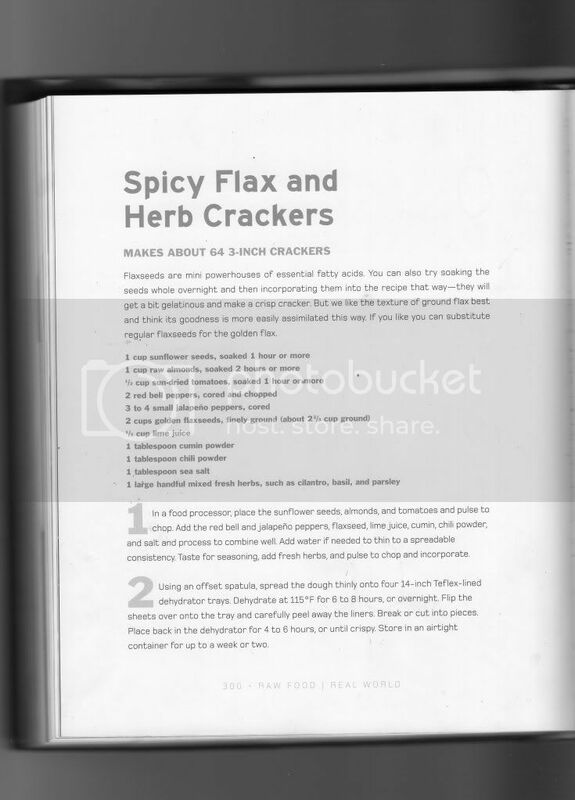 Here is the cracker recipe.